We pray for your provision, O God, for the food and company you send us for both our bodies and our souls. Feed us this morning, we pray. Speak to us and bring us to life again, in your Son’s name. Amen. Elijah was really, really tired. He had just fought a great battle of wills and symbols with the prophets of Baal, that idol that the Israelites so often worshipped. The prophets of Baal, 450 of them, made an offering to Baal, but no fire from heaven came down to accept their offering; Elijah, all alone, offered a bull that was swallowed up by heavenly fire. The people returned to the Lord. Elijah killed the prophets of Baal. The king and queen of Israel, worshippers of Baal, were furious. They sent a message to Elijah promising to kill him, and he fled to another country, and then further: into the wilderness, into the untamed land full of wild animals and demons. It is a request that is full of both despair and faithfulness. Despite feeling that his life is unutterably terrible, that he has nothing more to live for, Elijah still turns to God with that feeling. That takes an awful lot of faithfulness, to recognize your own inadequacies and feelings of despair and still offer them to God in lament. And God responds. An angel of God comes to Elijah, offers him food that gives him almost impossible strength. God responds, even though the most common analogy I’ve seen for this moment of Elijah’s is a hungry child seconds from a temper tantrum: “Just eat something and you’ll feel better. It’s not as bad as you think it is.” God responds, even though my personal connection to this story, my first reason that this felt familiar, was not grief at terrible news, or the pain that fills the world, or even some larger sin in my life. Nope. It was how a few days ago I went to bed without doing the dishes and it made me feel absolutely terrible. God responds. So often we judge our despair, or others’: that isn’t a big deal, it’s not that serious. I mean, look at Elijah: he had just defeated 450 prophets of Baal! Shouldn’t he have been confident in God? Confident in his office as prophet? Confident in the face of kingly opposition? And yet here he is, alone in the desert after fleeing. Or our own despair: people try to theologize it away, with “God’s in control” or “they’re in heaven” or “God calls us to joy, not despair.” I’m sure you can think of some more. And those truths can be deeply true without taking away our despair, our pain and suffering. God’s truths and our emotions can coexist. Look at God’s response: not to tell Elijah he’s being ridiculous, but to send an angel to tend to Elijah’s needs: to tell Elijah to eat and drink and sleep. To tell Elijah to take care of himself. Just like a parent, God takes care of Elijah, giving him what he needs when Elijah’s quite sure he actually needs something else. God is patient with Elijah. God not only cares for Elijah’s most physical needs, but also gives him space to do nothing except rest. And even while he is doing nothing for God, isn’t preaching or prophesying or doing signs or fighting Baal’s influence, God still cares for Elijah and loves him. For God doesn’t love Elijah or us because of what we do, because of what we believe. God loves us when we’re too exhausted to do anything but cry, and that means that God’s love is about far more than what we do. God loves who we are, because God is love, because God’s love is a deep and true love. Elijah came into the desert, full of despair, and sat down under a broom tree. As I said, they’re scraggly and not very tall and make terrible shade. 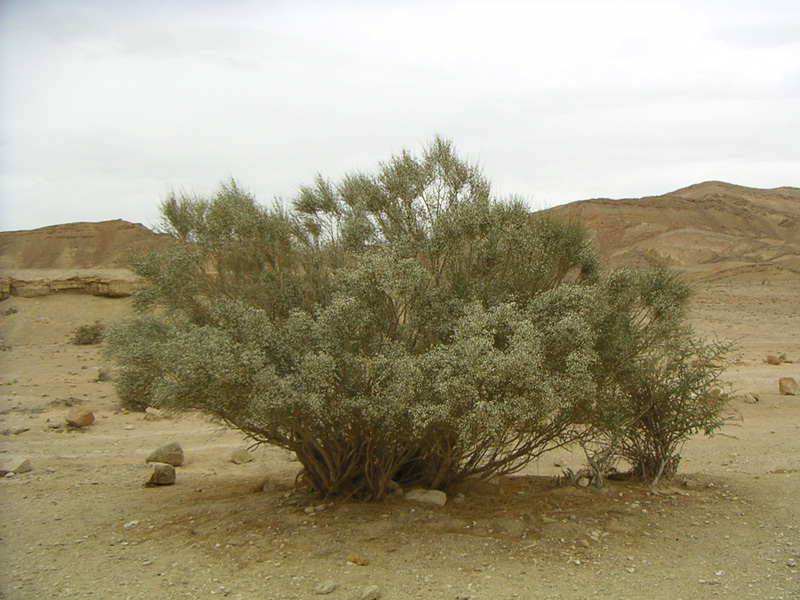 Broom trees were pretty common in Israel. They never grew very tall, but they make wonderful firewood and especially charcoal, for they keep their heat long after they look dead and cold in the fire pit. They were often used by desert travelers to cook their food, and then left for the next traveler, when they could be stirred up into improbable heat again. During the dry times they lose their leaves and look like dead sticks, but really they are waiting for rain in order to explode into growth and greenness. Broom trees, in other words, are survivors. They come out of the ashes and out of dryness and out of seeming death to live again, just as God bring us out of dryness and ashes and death to live again. No matter how full of death we seem, God brings us new life. We may not get angels; we may not get heavenly food. (then again, we might just not recognize it). But God provides for us. There are people in our lives who reach out to us, who remind us of what’s important, who show us what needs to be done and when we should just rest. There is food, physical or spiritual, the things that renew our bodies and our souls: all the things we love, fishing and reading and tinkering and eating. And, when all else fails–when everything else fades in importance, when despair is all-encompassing, we have God. We have a God who reaches out to us, who is with us, who died and rose again for us. God is with us, even in our despair, in our pain and our suffering.